Jim put together this recipe and suggests modifying the number of potatoes depending on how much “fish taste” is desired. The original restaurant recipe calls for deep frying, something I am neither inclined nor equipped to do, so the cakes were pan-fried in a non-stick pan and a little olive oil. 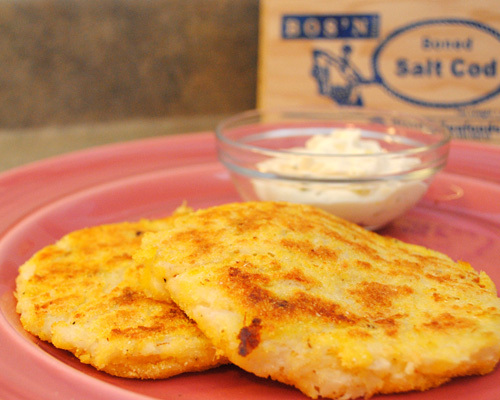 We formed the cod fish cakes the night before and refrigerated, which helped the cakes stay together during pan frying. Submerge the salt cod in a bowl of cold water overnight in the refrigerator to rehydrate the fish. The next day, drain the fish and discard the water. Peel the potatoes. Cover the potatoes and drained cod fish in water in the same stock pot over medium-high heat. Boil until the potatoes are well done, approximately 10 to 15 minutes. Drain the fish and potatoes and let cool slightly, until no longer teaming. Working in batches if necessary, depending on the size of your food processor, mix the fish, potatoes, and pepper. Add egg to fish and potato mixture and mix until incorporated. Heat 1 Tbsp. oil in a non-stick pan over medium heat. Add four cod fish cakes and cook until browned on both sides, flipping after 4 to 5 minutes if patties were frozen after the previous step, or 3 to 4 minutes if fresh. Repeat to finish cooking all cod fish cakes. Serve warm with Tartar Sauce. Uncooked cakes will store in the refrigerator or freezer to be cooked later.